Publication from the Botwin Company, formed by Jewish volunteers. ALBA’s George Watt Memorial Essay Prizes are awarded every year for excellence in student writing about the Spanish Civil War, the global political or cultural struggles against fascism, or the lifetime histories and contributions of the Americans who fought in support of the Spanish Republic from 1936 to 1939. The award—given to one undergraduate and one graduate—was established 12 years ago to honor the memory of Lincoln vet George Watt (1914-1994), a writer and lifelong activist whose work was central to the creation of ALBA. Watt had previously been involved in Communist youth activities. In 1937, at age 23, he joined the Abraham Lincoln Brigade. George’s wife, Ruth, a year younger, organized support for the fighters while George served as a political commissar for the Brigade in Spain. 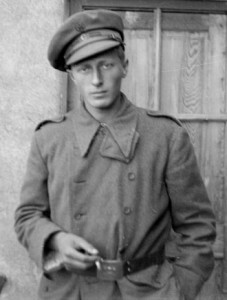 Watt’s distinguished battlefield action continued through the Second World War. Shot down over Belgium in 1943, Watt lost two of his crew. He survived thanks to the support of the Comet Line, an underground organization active in Belgium and France, with whose help Watt eventually made it back to England. As if these adventures were not dangerous enough, Watt at many turns risked being persecuted for his Jewish identity as well. Each year, as ALBA grants the George Watt Prize, ALBA pays homage to Watt’s example of intrepid anti-fascism and lifelong commitment to justice and social equality. The jury, consisting of Josh Goode (Claremont Graduate University) Mónica Cantero (Drew University), and Gina Herrmann (University of Oregon) received 17 submissions; five essays from graduate students and 12 from undergraduates. As in past years, the jury was pleased to find submissions from the US and abroad, and remarked on the high quality of research coming from Spain. The papers encompassed many themes related to ALBA’s mission and Watt’s enduring legacy including—in the undergraduate submissions—the functions played by Fire and Emergency Services during the war, the role of US neutrality on Naval policy toward Asia, and poverty in postwar Spain. Among the graduate essays, topics included the massacre of Republicans in Badajoz and the African presence in Franco’s army. The winner for the undergraduate category, Rotem Herrmann, is a student at New York University. 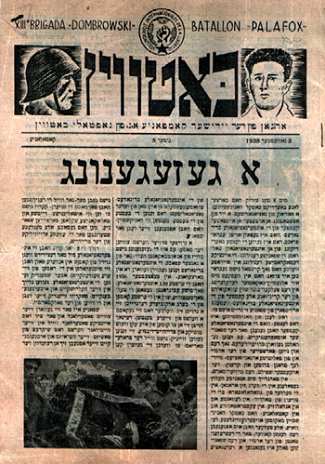 Herrmann (no relation) writes about the participation in the International Brigades of Jewish volunteers from the British Mandate of Palestine. Her essay looks at both Jewish and Communist identities of the Palestinian Jewish members of the IB, countering the assumption that Jewish faith was the more influential factor in moving volunteers to enlist. (Click here to read the whole text.) Her research reveals that the political commitment of the volunteers proved to be a stronger explanation for their participation in the Spanish Civil War than did their Judaism. 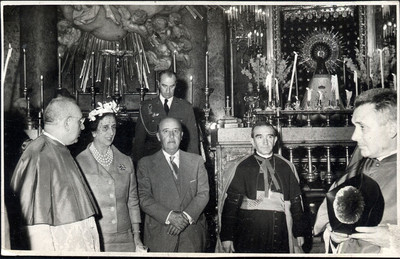 The aging Spanish dictator at the Church of La Virgen del Pilar in Zaragoza, with his wife and Archbishop Morcillo. Francisco Javier Ramón Solans, a visiting scholar at the Remarque Institute (New York University) and a PhD student at the University of Zaragoza (Spain), received the graduate prize for a section of his doctoral dissertation. (Click here to read the whole text.) Ramón Solans studies how the cult to the Virgen del Pilar (Virgin of the Pilar), an object of religious veneration in Zaragoza, influences national, public and political spheres of celebration and identity. He argues that the Virgen del Pilar has served as both a social anchor and as an ideological touchstone for different political and national groups and their respective world views. Through the Virgen, Ramón Solans maintains, we can observe the historical rise of National-Catholicism and its hold on governmental power during the Spanish dictatorships of Primo de Rivera and Francisco Franco. Gina Hermann chairs ALBA’s Watt Award committee.